One of your comments referred to rugs (orientals) AND paintings as art…to me,they’re the same. Orientals are paintings for the floor. I just bought an old Persian Gabbeh, and I can’t stop looking at it, it’s so exquisite! Every “flaw” tells me a story. So true, the idea of the rug as an investment. I’ve seen this in many West African countries, particularly in the Sahel, where the ideal room for receiving guests is one in which there is minimal furniture and one very large gorgeous rug. One can seat more people that way! Hi Susan, I enjoyed reading the article how you collected rug. I also collect old kimonos and recycle them into new wearable art pieces, as well as paint on silks . please look at my website to see my work. 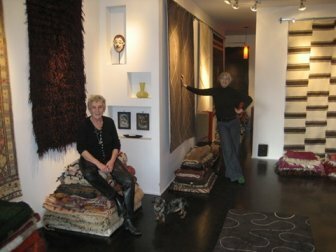 I would rather collect rugs than paintings and Susan’s are amazing! love the concept of rugs as currency. the luchre (sp?) of many cultures, ancient and current.